Georgian stone built cottage 500 yards to Bakewell's Town Centre - the Jewel in the crown of the Peak District located in the Peak National Park close to court yard shops/walks/bars/cafes and restaurants and of course the famous Bakewell Pudding! 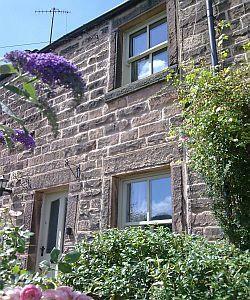 Sleeps 4/5 in 2 bedrooms the 3rd being an attic room suitable for older children or teenagers. Comfortable beds for a good night's sleep. (Access from attic to downstairs is via either bedroom - bathroom is "jack n Jill" - access from both 1st floor bedrooms . The cottage is fully equipped with a home from home feel and we pride ourselves on our cottage cleanliness. Convenient for visiting Chatsworth, Haddon Hall, The Heights of Abraham and many more attractions. Beautiful walks and trails close by - Lathkill Dale The Monsal Head which has also a cycle hire centre. The Annual Bakewell Show is held over two days in early August it attracts thousands of visitors as does the Eroica Britannia vintage bicycle event in June.